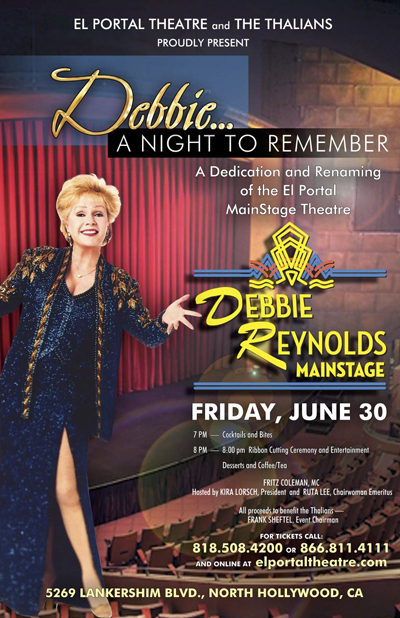 To honor the legacy of actress Debbie Reynolds, El Portal Theatre is renaming the Mainstage as “The Debbie Reynolds Main Stage at El Portal.” Theatre owners Bernard Kaufman and Gary Goodgame, with Jay Irwin and Pegge Forrest Producers, along with The Thalians, proudly present Debbie…A Night to Remember: A Dedication and Renaming of the Historic El Portal Mainstage Theatre located at 5269 Lankershim Blvd. in the NoHo Arts District of North Hollywood on Friday, June 30th at 7pm. This amazing lady played El Portal 46 times between 2003 and 2015 in productions of Love Letters and with her fantastic Vegas one-woman show. In an energetic and heartfelt tribute to the woman who frequented El Portal as a youth and returned with her one–woman show years later, we are featuring a select few performers who have a connection to Debbie and El Portal. As a young girl, Debbie Reynolds would ride her bicycle from her home in Burbank to watch movies at El Portal which was then a movie theatre. She then performed at El Portal many times in the twilight of her stellar, international career. She also owned and operated Debbie Reynolds Studios (DR Studios) just north of El Portal on Lankershim Blvd., inspiring hundreds of dancers, singers and young performers. The evening will be hosted by NBC’s Fritz Coleman with special appearances by Beth Malone (currently in rehearsals for the Broadway bound The Unsinkable Molly Brown and 2016 Tony nominee for Fun Home), Sam Harris (1997 Tony nominee and multi-platinum recording artist), Jay Johnson (2007 Tony winner), Jean Luisa Kelly (television star and recording artist), Director/Musical Director Todd Schroeder and award winning choreographer Cheryl Baxter, who is rounding up L.A.’s best dancers and choreographers in a “tapping” surprise salute to Hollywood’s brightest star – Debbie Reynolds. Todd Fisher, Debbie’s son and his wife, actress Catherine Hickland, will be part of the celebration and ribbon cutting and additional stars will be announced as we approach the day of the show! The event is led by Thalians’ Chairwoman Emeritus Ruta Lee, and Frank Sheftel, Event Chairman. For nearly 60 years The Thalians, led by Debbie Reynolds and actress Ruta Lee, have raised over $35 million for mental health related causes. A majority of the contributions have come through The Thalians Annual Galas, a Who’s Who of the Hollywood elite honoring a Mr. or Ms. Wonderful with an award designed by the legendary Walt Disney himself. The coveted trophy is given to a member of the entertainment industry not only for their work on stage and screen but also for their behind-the-scenes philanthropy. A partial list of the honorees includes Frank Sinatra, Mary Martin, Lana Turner, Ed Sullivan, Shirley MacLaine, Gene Kelly, Sammy Davis, Jr., Lucille Ball, to name a few. All proceeds will benefit the Thalians charity to support the Wounded Warriors project. El Portal Theatre is a historic landmark in the heart of North Hollywood just minutes from Universal Studios, Warner Brothers, Disney, ABC, CBS-Radford and NBC Burbank. For tickets and information call (818) 508-4200 or online at ElPortalTheatre.com.